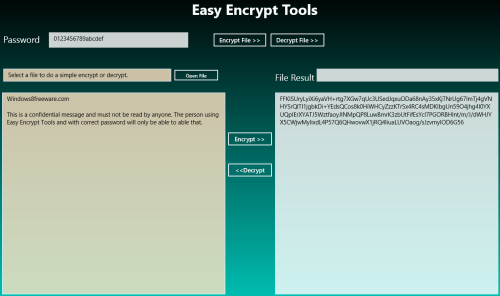 Easy Encrypt Tools is an encryption app for Windows 8 that allows you to encrypt data or text and to decrypt the same. This text encryption Windows 8 app implements key/password based high-grade encryption making it nearly impossible for unauthorized parties to access the real content. In addition, encryption app for Windows 8 can fetch content from a text file and create another one containing encrypted text in it. Easy Encrypt Tools suits best for sending confidential information that you don’t want to share with any third-party. Even if the file or text goes in wrong hands, then too it won’t make any sense without right key. On launching this Windows 8 encryption app, you will be presented the following interface. On top of the page will be a randomly generated password with a set of one textbox and multi-line on both sides of window. In the center exits the two buttons stating ‘Encrypt>>’ and ‘<<Decrypt’. Let us now focus on the How-to part of the app. The encryption app supports only text to text encryption. Have a look on following points. All you need is to copy-paste or type the text in the textbox to the left section. Next, you require specifying a password in the textbox at top-left corner. Make sure that the password must be easy to remember, but hard to guess for others. Then, click on ‘Encrypt’ button and in no time you will be presented the encrypted text in the large multi-line to the right. Now, you can copy the encrypted text and use as per requirement. For decryption, you will require to enter correct password. then paste the encrypted text in the large textbox in right section and click on ‘Decrypt‘ button. To install Easy Encrypt Tools you require opening this link in supported web browser such as Internet Explorer 10 or later. Then click on ‘View in Windows Store’ button followed by a click on ‘Install’ button. Easy Encrypt Tools is a light and simple utility. Use it the way you want it.